You will be given a reference e-book to read which has 750 pages And the test will be based on that e-book , you can take final test within 1 year of purchase. When it comes to learning different types of Java web services, you have to know exactly what is Java and its major functions. Java was originally developed at Sun Microsystems by James Gosling and has been released in the year 1995 as the major component of the Java platform of Sun Microsystems. It is a programming language which takes the syntax that it uses from C++ and C. However, it is also popular for using lesser low-level facilities and simpler object models than those used by C++ and C. All the applications that are produced using Java are compiled to class file called bytecode which anyone can operate on all Java virtual machines no matter what kind of computer architecture is used. Java also refers to a class-based, concurrent, object-oriented and general purpose language which is designed specifically to obtain as much implementation dependencies as possible. Its main function is to allow various application developers to write once and run it anywhere. This means that the developers can write codes on a single platform that does not require recompilation when operated on another platform. Because of the effectiveness of Java, it is no longer surprising why it has become one of the most popular programming languages at present and why Java web services continue to win the attention of many. Web services actually refer to applications based on the web and use XML based and open standards with an aim of transporting protocols in exchanging data with numerous clients. These services are now developed by Java Technology tools and APIs. 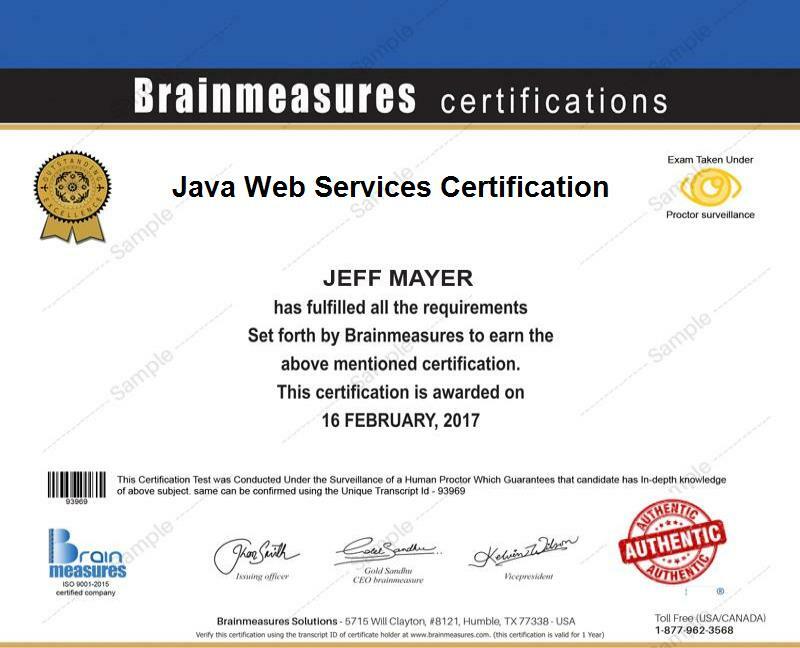 The Java web services certification program which is now available at Brainmeasures is your ticket towards gaining a more complete understanding about Java and the different web services that can be produced by the programming language. With the help of the Java web services course, your knowledge about this field will be greatly honed so providing high quality web services based on the Java programming language will be possible. The entire certification course offers a wide coverage for its Java web services training so coming out as an expert in this industry will never become that difficult. By driving yourself towards completing the Java web services certification course, you will finally become a certified professional in the industry. You can use your certificate to show proof that you are indeed a master and an expert in Java programming and in providing excellent web services that are completely based on the language. The Java web services certification program from Brainmeasures is extremely beneficial to those who are planning to take advantage of the Java programming language and even those who already have experience in using the platform. It is most suitable for managers, architects, programmers and any other professionals who are greatly interested about integrating useful Java applications all over the web. Earning your Java web services certification is also a major help when it comes to making significant changes on the level of your income. If you use your Java web services certification to work as a Java web services developer, then you can expect this profession to offer you a salary of around $72,000 to $105,000 every year. If you work as a Java programmer, then this profession will give you an average annual salary of $90,000. It is also possible for you to get the position of a Java architect which will let you earn within the range of $109,000 to $138,000 per year.